I was so busy with shows in January that I only now finally had time to write about them. First there was Burning Libraries at the top of December. It was a great multi-media work based on 30 recordings of immigrants talking about how they arrived the US. There are so many immigrants in the bay area that the piece really hit home. There were aerialists, acrobatics, and lots of projections. The operation of the sound design was quite simple as it was all set to run automatically in QLab, but the install was tricky. I brought my computer-based mix system. Jim Quinn brought two UPJs. Probably the one thing we spent the most time on during the install was finding the correct splay angle between the two speakers. We went back and forth with a few different tools before finally settling on two steel rods and a big protractor. I’m still not sure how pros do this. I should note, though, that we were abusing the mounting hardware. That peice on top is not supposed to be used like that! Back in November I started working on a theatrical adaptation of the 1985 film Clue at Boxcar Theatre. After seeing the film I became a big fan. It’s a hilarious mess with some great actors including Tim Curry. Aside from some key elements, our production is a complete rip-off of the film. The script is taken from the film, the set is based on the board-game, and I cut my audio directly from the DVD. There is so much great underscoring by John Morris in the film. It was a shame that I could only edit out as much as I could that didn’t have sound FX or dialogue on top of it. Ironically, the sound-track just came out for the first time, a month after our show opened. The set for Clue is really exciting. The audience sits 8 feet in the air surrounded the actors. Boxcar Theatre is small and only has four speakers. So the only way I could cover the audience and still have enough for other positions was to put one in the center as high as possible. I seems that I find myself inadvertantly risking my life for theatre at least once a year. There were some other technical challenges with this production. First, their computer wasn’t fast enough to run my sound design, so I convinced the artistic directors to buy new one. Next, there weren’t enough speakers or amps so I donated a home stereo speaker and my 4-channel amp for the run. That’s what you hear when the radio is playing at the top of the show. “What are you planning to do when you’re in SF? Clue runs through February 25th at Boxcar Theatre. Big thanks to Jim Quinn for loaning Boxcar Theatre his audio interface for the run. The day after Clue opened I got a call to fill in the sound designer position at the last minute for the west-coast premiere of the english drama Harper Regan at SF Playhouse. To catch up I had to start creating cues as I was reading the script. References to pop music are found so often in the text that I decided that that would be my focus. I included tracks from Arcade Fire, The Slits, Johnny Marr, and Modest Mouse. It was only by serendipity that I choose the Modest Mouse song Tiny Hotel to end the show. It popped up on my iTunes library and I knew it would be perfect. Only later did I find out that Johnny Marr had played with Modest Mouse on that album on that song! No one has asked me yet, but if they do, I’ll tell them it was all my grand design. I had to update the computer OS and software at SF Playhouse, but the biggest challenge really was the ambient noise. The ceiling is low and depending on where you sit in the audience it can feel like the lights are screaming at you! Instead of delicate textures for locational reinforcement like I had originally hoped, I switched to just blasting it at the top of each scene for a few seconds before fading away. 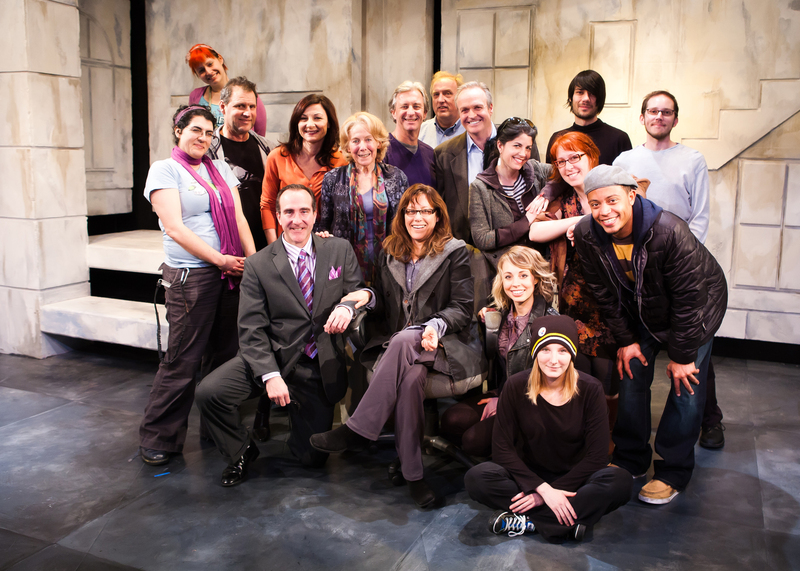 Harper Regan runs through March 5th at SF Playhouse. Big thanks to Freesound.org from where I sourced a lot of British ambient sounds.